In the golf world the month of April belongs to one tournament. A tournament that for the last 84 years has featured some of the best players, story lines and performances. 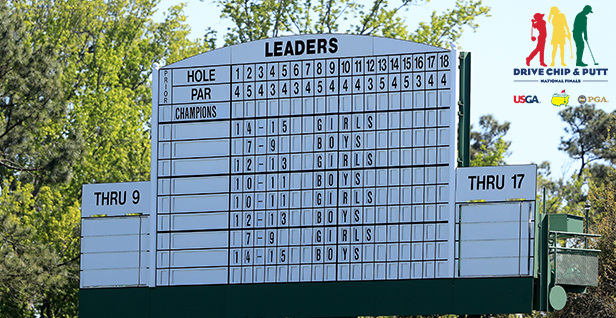 The Masters has come to be known as, “a tradition unlike any other,” to all golf fans. But, before we get to one of golf’s biggest spectacles, Augusta National will host 80 junior golfers for the Drive, Chip and Putt National Finals. Among those 80 participates are Taya Belloma and Isaac Rumler, both of which qualified through the Iowa PGA’s Drive, Chip and Putt events in 2018. Taya Belloma, of Centerville, IA, like many young kids, is involved with a handful of sports at the age of nine. She plays golf, softball, basketball and is also involved in bowling, but golf was her first passion as she picked up the game at the age of one. Taya’s love for golf at such a young age lead her father to search for ways to get her more involved in golf and gain experience in what is like to compete in golf. In the end, he landed on Drive, Chip and Putt as the starting point for Taya. Taya has participated in Drive, Chip and Putt the last three years since discovering the program. At the age of seven, Taya won the her first ever local qualifier for age division and advanced to the Sub-Regional qualifier at Des Moines Golf and Country Club, but did not advance to the Regional Final. Last year, Taya won the local qualifier at Waterloo and placed second at the Sub-Regional qualifier at Warrior Run Golf Course to advance to the Regional qualifier in Minnesota. Taya didn’t fair to well in her first Regional Final, but she took it in stride and used it as a learning experience to prevail this year. The experience proved to help Taya as she finished second at the Warrior Run local qualifier on August 5 with a total score of 52. Her 15 in the driving competition was the highest in her age group. She carded 11 points at the chip station and 26 points in the putt competition. At the Sub-Regional at Glen Oaks Country Club, Taya recorded 89 points, prevailing over the second-place finisher by 37 points. Taya recorded the highest point totals in each station, finishing with 27 points in the drive station, 21 points at the chip station and 41 points in the putt competition. On September 29, Taya conquered the Regional qualifier that stood in her way last year as she accumulated 86 points and the highest point total in the drive competition (23). She also recorded 36 points at the chip station and 27 points in the putt competition to secure her spot in the National Final at Augusta National. Like Taya, Isaac is involved in many sports, including basketball, soccer, hockey and golf. He also got introduced to golf at a young age by his father. Golf originally started as a father-son activity for Isaac and his dad, Matt who live in Silvis, IL. Matt and Isaac enjoy playing their favorite sport while spending time together. It wasn’t until a Drive, Chip and Putt commercial aired on the Masters broadcast that the idea of Drive, Chip and Putt crossed their minds. Isaac has since participated in Drive, Chip and Putt for three times. He qualified for the Regional Final last year, but didn’t advance onto the National Finals. Isaac first competed in Drive, Chip and Putt when he was seven, but didn’t qualify out of the local qualifier. Nonetheless, Isaac has stuck with golf, progressing each year and most importantly having fun. Isaac handled the pressure quite well this year as he finished first with a total score of 98 at the local qualifier at TPC Deere Run. He finished with the highest amount of points in the drive competition with 21 points and in the chip competition with 30 points. He also recorded 47 points at the putt station to advance to the Sub-Regional qualifier. It was more of the same at the Sub-Regional qualifier where Isaac finished second with 108 points. He accumulated 32 points in the drive station, 26 points at the chip station and 50 points in the putt competition. His 32 points in the drive competition was the highest score in his age division. At the Regional qualifier he totaled 126 points to win his age division. Rumler finished with 31 points at the drive station, 50 points at the chip station and 45 points in the putt competition. Rumler’s 126 points won his age division by two points and punched his ticket to the National Final. Isaac and his family are aware of the pressure and stress that Drive, Chip and Putt can pose. They like to keep things light and not add on the pressure that is already present. Both Taya and Isaac are preparing for Augusta in the best ways they can with the cold weather in Iowa and Illinois. However, they are both aware that April is right around the corner. Nerves and excitement alike have begun to set in for Taya and Isaac as they prepare to embark on the same coveted grounds that the PGA TOUR’s finest will take too a week later. Finals is centered around the enjoyment of playing golf, meeting new people and having fun. Regardless of the outcome, Taya and Isaac have both accomplished a great feat in advancing to the National Finals. The Iowa PGA wishes them the best of luck and hopes they enjoy their experiences. The Drive, Chip and Putt National Finals take place Sunday, April 7 at Augusta National Golf Club. The Finals will be broadcasted on the Golf Channel.